Augusta County is a county located in the Shenandoah Valley on the western edge of the U.S. commonwealth of Virginia. It is the second-largest county in Virginia by total area, and it completely surrounds the independent cities of Staunton and Waynesboro. 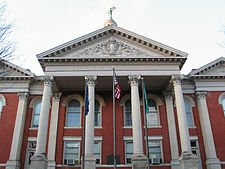 The county seat of Augusta is Staunton, although most of the administrative services have offices in neighboring Verona. As of the 2010 census, the county population was 73,750, which represented an increase of more than 34 percent over the 1990 figure. Along with Staunton and Waynesboro, it forms the Staunton–Waynesboro, VA Metropolitan Statistical Area. Augusta County was formed in 1738 from Orange County, although, because few people lived there, the county government was not organized until 1745. It was named for Augusta of Saxe-Gotha, Princess of Wales and mother of the future King George III of the United Kingdom. Originally, Augusta County was a vast territory with an indefinite western boundary. Most of what is now West Virginia as well as the whole of Kentucky were formed from it, and it also claimed the territory north and west of those areas, theoretically all the way to the Pacific Ocean. A series of maps show the formation and division of Augusta County from 1738 through 1791. Reductions in its extent began in 1770, when its southern part became Botetourt County. In 1776 part of western Augusta County, an area also known as the District of West Augusta, became Monongalia County, Ohio County, and Yohogania County (abolished in 1786). In 1778 the portion of Augusta County west of the Ohio River became Illinois County (abolished in 1784); the northeastern part of what was remained became Rockingham County, and the southwestern part was combined with part of Botetourt County to form Rockbridge County. In 1788 the northern part of the county was combined with part of Hardy County to become Pendleton County. Augusta County assumed its present dimensions in 1790, when its western part was combined with parts of Botetourt County and Greenbrier County to form Bath County. During the Civil War, Augusta County served as an important agricultural center as part of the "Breadbasket of the Confederacy." The Virginia Central Railroad ran through the county, linking the Shenandoah Valley to the Confederate capital at Richmond. One of the bloodiest engagements fought in the Shenandoah Valley took place on June 5, 1864 at the Battle of Piedmont, a Union victory that allowed the Union Army to occupy Staunton and destroy many of the facilities that supported the Confederate war effort. Augusta County suffered again during General Philip H. Sheridan's "Burning," which destroyed many farms and killed virtually all of the farm animals. Staunton, the county seat for many years, was incorporated as a city in 1871 and separated from Augusta County in 1902. However, it remained the county seat. 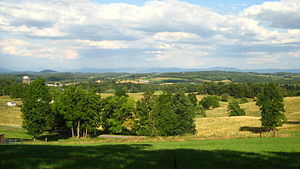 View of Augusta County countryside across the Shenandoah Valley toward the Blue Ridge Mountains. According to the U.S. Census Bureau, the county has a total area of 971 square miles (2,510 km2), of which 967 square miles (2,500 km2) is land and 3.9 square miles (10 km2) (0.4%) is water. It is the third-largest county in Virginia by land area and second-largest by total area. The county is divided into seven magisterial districts: Beverley Manor, Middle River, North River, Pastures, Riverheads, South River, and Wayne. The county is serviced by Augusta County Public Schools. As of the Census of 2000, there were 65,615 people, 24,818 households, and 18,911 families residing in the county. The population density was 68 people per square mile (26/km²). There were 26,738 housing units at an average density of 28 per square mile (11/km²). The racial makeup of the county was 95.02% White, 3.60% Black or African American, 0.15% Native American, 0.28% Asian, 0.02% Pacific Islander, 0.32% from other races, and 0.61% from two or more races. 0.94% of the population were Hispanic or Latino of any race. There were 24,818 households of which 33.00% had children under the age of 18 living with them, 63.70% were married couples living together, 8.60% had a female householder with no husband present, and 23.80% were non-families. 20.10% of all households were made up of individuals and 8.10% had someone living alone who was 65 years of age or older. The average household size was 2.56 and the average family size was 2.94. In the county, the population was spread out with 23.70% under the age of 18, 6.90% from 18 to 24, 29.80% from 25 to 44, 26.80% from 45 to 64, and 12.80% who were 65 years of age or older. The median age was 39 years. For every 100 females there were 101.10 males. For every 100 females age 18 and over, there were 99.80 males. The median income for a household in the county was $43,045, and the median income for a family was $48,579. Males had a median income of $31,577 versus $24,233 for females. The per capita income for the county was $19,744. About 4.20% of families and 5.80% of the population were below the poverty line, including 6.40% of those under age 18 and 6.60% of those age 65 or over. The majority of Grottoes is located in Rockingham County. Only seven of the town's 2,668 residents reside in Augusta County. Augusta County is represented by Republican Emmett W. Hanger in the Virginia Senate, Republican Richard P. "Dickie" Bell, Republican Ben L. Cline, and Republican R. Steven "Steve" Landes in the Virginia House of Delegates, and Republican Robert W. "Bob" Goodlatte in the U.S. House of Representatives. The independent cities of Staunton and Waynesboro (incorporated as such in 1902 and 1948 respectively) are located within the boundaries of Augusta County, but are not a part of the county, despite Staunton's status as the county seat. Most county administrative offices, however, are located in Verona, rather than in Staunton. John P. Gaines, (1795–1857), born in Augusta County, United States Congressman from Kentucky and governor of the Oregon Territory. John D. Imboden, (1823–1895), born in Augusta County, member of the Virginia General Assembly, Confederate Army cavalry general and partisan fighter in the American Civil War. "Irish" John Lewis (1678–1762), opened up what is now Augusta County to settlement. Thomas Lewis, Jr., born in Augusta County, United States Congressman from Virginia. William J. Lewis, (1766–1828), born in Augusta County, United States Congressman from Virginia. Robert D. Lilley, (1836–1886), born in Greenville, Augusta County, Confederate Army general in the American Civil War. Benjamin Logan, (c.1742-1803), born in Augusta County, United States Congressman from Kentucky. George Mathews, (1739–1812), born in Augusta County, United States Congressman and Governor of Georgia. Member of the Mathews family. Sampson Mathews, (c. 1737 -1806), born in Augusta County, Virginia State Senator and Revolutionary War officer. Member of the Mathews family. Robert McKnight (c.1789-1846), born in Augusta County, moved to St. Louis, Missouri in 1809, member of a trading expedition under Zebulon Pike to Santa Fe, New Mexico in 1812, captured by Spanish and imprisoned until 1821, eventually renounced his United States citizenship, moved to Mexico, and became owner of the Santa Rita del Cobre copper mine in Chihuahua (now New Mexico). Joel F. Salatin (b. 1957), founder, owner and manager of Polyface Farm in Swoope, Virginia. Thomas Woodrow Wilson (B. Dec. 28,1856 - D. Feb. 3,1924) 28th President of the United States of America, 34th Governor of New Jersey, and 13th President of Princeton University located in Priceton, New Jersey. ^ "Mocavo and Findmypast are coming together - findmypast.com". www.mocavo.com. Retrieved 3 April 2018. ^ "August County, VA: History". Augusta County, Virginia. Archived from the original on 8 June 2011. Retrieved 16 July 2014. ^ "Incorporated Places and Minor Civil Divisions Datasets: Subcounty Resident Population Estimates: April 1, 2010 to July 1, 2014". United States Census Bureau. Archived from the original on 23 May 2015. Retrieved 14 February 2016. ^ a b c d e f g h i j k l m n o p q Who Was Who in America, Historical Volume, 1607-1896. Chicago: Marquis Who's Who. 1963. ^ John Meriwether McAllister and Mrs. Lura May Boulton Tandy (1906). Genealogies of the Lewis and kindred families. Columbia, Missouri: E. W. Stephens Publishing Company. Peyton's History of Augusta County, Virginia (1882), searchable online edition of the 1882 edition by J. Lewis Peyton. Waddell's Annals of Augusta County, Virginia, from 1726 to 1871, searchable online edition of the 1902 second edition by Jos. A. Waddell. Augusta County Resources, a Rootsweb page of historical and genealogical links and references, including maps. Wikimedia Commons has media related to Augusta County, Virginia. Wikisource has the text of an 1879 American Cyclopædia article about Augusta County, Virginia.